This succinct, authoritative, and engagingly written history of Nigeria from its earliest beginnings through 1998 provides an excellent introduction to the country's history. Constructed around the two interrelated themes of politics and the economy, it relates the development of the Nigerian people from antiquity through the end of 1998. Following a timeline of events in the history of Nigeria, Professor Falola, a leading historian on Nigeria and a distinguished Africanist, provides a readable, coherent narrative that carefully integrates the past into the present to help the student and general reader understand the forces at play in the development of the country throughout its long history. Biographical sketches of notable Nigerians, maps, and a bibliographical essay will aid the beginning researcher. 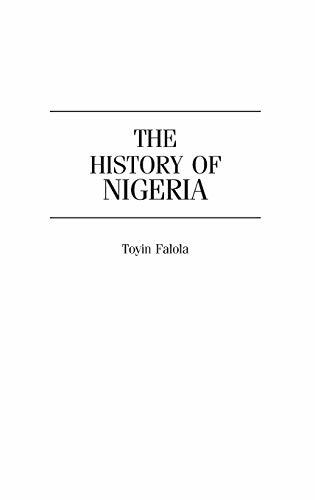 Falola examines the development of civilization among different Nigerian communities from antiquity, the consequences of the introduction of Islam and Christianity, the decimation of the population from the slave trade, the imposition of colonial rule and its effects, the transfer of power to the Nigerians in 1960, and the subsequent turmoil in the government and economy. The work analyzes the complicated journey of Nigeria to the present day, which is marked by political instability and economic underdevelopment. It is a story of Nigeria's failure to fulfill the expectations of its people while using its oil resources to become a giant.